Pasta that has been shaped into small spheres and toasted. Today, pearl (or Israeli) couscous can be found on American restaurant menus and grocery shelves and is actually quite trendy. 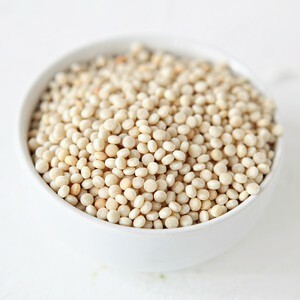 Oftentimes used in place of rice or pasta, pearl couscous can be incorporated into a wide range of dishes. From soup to risotto, to salads to meat-based recipes, pearl couscous adds texture and, like rice, takes on the flavors of the ingredients with which it is cooked. It is slightly chewy and has a mild nutty flavor due to being toasted. Though it is typically made from white flour, it can also be prepared from whole-wheat flour (providing more fiber and important vitamins and minerals). Israeli couscous is low in fat and does not contain any cholesterol or sodium. We have a few recipes up our sleeve for Israeli couscous. Give it a try in our Spiced Eggplant Steaks with Lemon-Garlic Couscous. With Fall around the corner, our Acorn Squash and Chickpea Stew over Couscous with Feta and Mint hits the spot. Or, go for the lighter option of our Warm Israeli Couscous, Caramelized Fennel, Pear and Grapefruit Salad with Almonds, Feta and Mint. Whichever way you choose, Israeli couscous is sure to deliver.